Join us for the first of our new and improved LBL meetings! 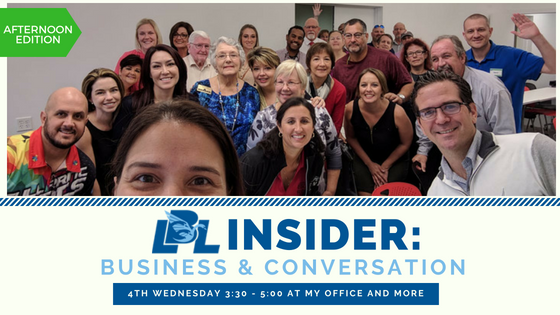 The LBL Insider Meetings will be held twice a month – on Wednesdays. The 2nd Wednesday meetings will be held at Catapult (7:30 – 9:00 am). The 4th Wednesday will be held at My Office & More from 3:30-5:00 pm. Our hope is that we can cater to as many members as possible, who are looking for valuable content through relevant business conversations. Bring your favorite coffee, and your business cards and let’s dig into the issues we’re facing, and draw on our own experiences to help other members get through challenges, find new ways to grow their businesses, and simply connect with like-minded, caring business owners who understand the power of connections! Each meeting will be driven by a topic discussed in the Lakeland Business Leaders Community. Our goal is to give our members the opportunity to share their experiences, ask questions and receive important feedback from other members on business related topics. Are you a current premium member? Great! No need to take any action, just attend the meetings, like you always have! Please consider joining, as these meetings are a benefit of membership. Alternatively, you can reach out to a premium member and ask them to invite you! Once you have an invitation from a member, please register for a guest ticket, and include the name of the person who invited you!